What follows is a letter I wrote to my state legislator a few weeks ago. She listened and was positive in her response and for that I’m grateful. We’ve worked hard to make the best of PARCC testing and to make it as doable as possible for teachers and students. I decided to share the following letter more widely after watching our first three days of PARCC testing. We intend to see this testing through because much has been invested in training and preparation by students and adults. Completing this task is also our job. Hopefully, this is a learning experience that will help us avoid repeating this type of testing again. I’ll begin with a disclaimer. I am not a statistician or state policy expert. I am a school principal with ten years of teaching experience prior to becoming a principal. My views on the cost of PARCC (Partnership for Assessment of Readiness for College and Career) are from the school level, observing teachers and students every day in the classroom. I apologize for stating the following “qualifications,” but want to make it clear that I take education seriously, expecting accountability from students, teachers, and myself. In 2006, I was selected as a National Distinguished Principal representing the state of Arkansas. I’ve completed Phase III of the Arkansas Leadership Academy’s Principal Institute and have served as president of our state’s elementary principal association and more recently, the Arkansas Association of Educational Administrators in 2013-14. We, along with the other schools in our district, received rave reviews from the AdvancEd team site visit last year. We embrace accountability! I recently wrote a short history of assessment in Arkansas for our parents, trying to frame PARCC in positive terms with hopes that we will see changes. After taking students through the Infrastructure PARCC practice, I am now truly appalled at how we are going to assess students in Arkansas. Implementing the Benchmark Exam was a challenge, but doable, and its use has helped us make great gains in Arkansas. I supported the implementation of more rigorous assessments and became deeply involved in working to improve students’ reading, writing and problem solving skills. I see value in the Common Core State Standards and have supported their implementation in spite of occasional pushback from stakeholders. The implementation of PARCC takes us to a sad place in Arkansas schools. The cost per student for the PARCC is $23.97 plus a small administrative fee according to the PARCC website. The true costs of PARCC are incalculable and depend on many factors at the local school level. For several years, school districts have made their best guesses on what technology would be needed for PARCC assessments, and millions of dollars have been wasted in some districts. Information from Pearson to district technology specialists has changed over time, causing false starts and inefficient use of funds as districts tried to anticipate and prepare for future needs. The PARCC is costing our students immense losses in learning content and quality. Schools are trying to teach students specific technology skills simply so they can take the PARCC. These technology skills are not occurring at developmentally appropriate times for students. Many states have been giving computer-based assessments for several years, but these tests did not require students in the third grade to toggle between multiple pages and passages to answer a question. The PARCC requires keyboarding skills that are not appropriate for 8-12-year-old children. The testing window is costing instructional time in an already short school year. The Performance Based Assessments (PBA) window is March 9 – April 9. It will take four weeks if the weather cooperates, for our school to work through the first round of PARCC due to limited number of computer labs and a desire to avoid exhausting students with all-day testing. The End of Year (EOY) assessment window is April 27-May 22. It will take our school two uninterrupted weeks to complete this assessment with all of our students. Together, testing will occupy six weeks on our campus if there are no unforeseen interruptions. On any given day, rather than students acquiring technology skills needed for their future, computer labs will be occupied by students taking the PARCC. Long testing windows will cause instructional schedules to be in flux during these weeks, complicating lesson planning and the orderly sequence of instruction. School personnel are being misused because of PARCC. Our school is grades 3-5, so all grade levels are tested. Our assistant principal and literacy intervention teacher have spent countless hours developing a schedule that allows students to complete the PARCC. Our counselor has spent hours preparing for PARCC administration and training teachers to administer the PARCC. Meeting the psychological and emotional needs of students is more challenging because of the divided attention from all of these staff members. As principal, I assist with test preparations but a larger amount of my time is dedicated to implementing a new statewide teacher evaluation system currently in its first year. During teacher observations and evaluations I have been focused on trying to provide encouragement for students and teachers facing an unreasonably difficult and developmentally inappropriate high-stakes tests. Charlotte Danielson’s comment in Education Week about these new assessments is revealing: I’m concerned that we may be headed for a train wreck there. The test items I’ve seen that have been released so far are extremely challenging. If I had to take a test that was entirely comprised of items like that, I’m not sure that I would pass it—and I’ve got a bunch of degrees. So I do worry that in some schools we’ll have 80 percent or some large number of students failing. That’s what I mean by train wreck. 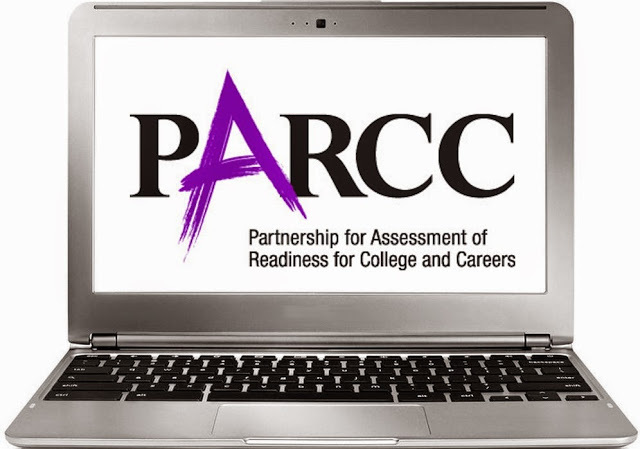 Go to the following link for information on the readability levels of PARCC and why most children will “fail” the PARCC. We have been the envy of other countries because of our students’ innovation and creativity. If we continue down our present hyper-assessment path, we will lose the qualities that make us competitive on the world economic and political stage. A first step will be to take a long and serious look at how we assess student learning and move quickly to bring balanced approaches to measuring student growth without forcing out creativity and the joy of learning. By ozarkmountainhiker in Uncategorized on March 11, 2015 .